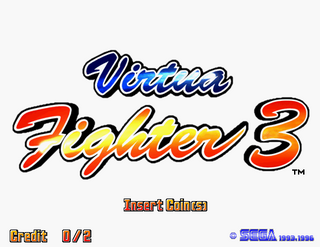 Virtua Fighter 3 (バーチャファイター3) is the third entry in the Virtua Fighter series, and a direct sequel to Virtua Fighter 2. It was released in 1996 for Sega Model 3 Step 1.0 arcade hardware, as the first game to hit the system, followed by Scud Race. Virtua Fighter 3 builds on the work seen in Virtua Fighter 2, however unlike its two immediate predecessors, the game doubled up as a technical showcase for cutting-edge Sega hardware (in this case, the Model 3 board). This iteration adds undulation for some of its arenas, such as a staircase in Lau's stage, a sloping roof for Pai and a raft constructed of individually moving elements bobbing on a water surface. Some stages are "multi-level" (similar to the techniques used in Mortal Kombat III), and while all the arenas in Virtua Fighter and Virtua Fighter 2 were square, stages in Virtua Fighter 3 are a wide variety of shapes. The "ring out" system has also been downgraded - while it has not been removed entirely, some stages have walls, and characters can use said walls to their advantage. A fourth button, "Dodge", was added to the Kick, Punch and Guard commands of previous titles (although its inclusion was not originally intended). Pressing the button with the joystick in neutral or held up makes the character move into the screen (i.e. away from the viewer), while pressing the button with the joystick held down makes the character move out of the screen (i.e. towards the viewer). This 'evasion' technique enables players to dodge incoming attacks, creating opportunities to counter-attack almost immediately. Two new playable characters were added; Aoi Umenokoji and Taka Arashi, the latter of whom represented a huge technical challenge due to his size and subsequently failed to appear in Virtua Fighter 4. With the exception of Dural who has none, characters' eyes in Virtua Fighter 3 are able to move independently from the head, and so can track the opposing player during a fight. Characters also exhibit heavy breathing and more emotion after performing moves, and clothing is less rigidly attached to their bodies, creating a simplified "silk" effect in places. Faces in the game are reportedly comprised of about 1,000 polygons. As with its predecessor, work on Virtua Fighter 3 is believed to have begun shortly after the end of Virtua Fighter 2. Concepts for Virtua Fighter 3 were drawn up and to some degree implemented in advance of the Model 3 board being finalised. In fact, for a while, it appears that Virtua Fighter 3 was literally just an enhanced version of Virtua Fighter 2, with select Japanese journalists being allowed access to what was presumably a version still running on Sega Model 2 code. 100,000 Sega Saturn owners we later given a promotional Virtua Fighter disc with pre-rendered artwork reportedly set to be used in Virtua Fighter 3 - this subsequently evolved into an eleven-part "CG Portrait series" starting with Virtua Fighter CG Portrait Series Vol.1 Sarah Bryant. Many of the character models in Virtua Fighter 3 are said to have stemmed from the Virtua Fighter CG Portrait Series, with models being converted to Model 3 hardware. Exceptions include Dural who was likely re-built from the ground up, and predictably the two fighters who did not appear in Virtua Fighter 2. Virtua Fighter 3 was first shown to the public at AOU Show 1996. The game was not readily playable, showing instead a rolling demo of six characters; newcomer Aoi, Lau, Jacky, Pai, Jeffry and Dural. While rendered by Model 3 hardware, the sequences were scripted to demonstrate the advance in technology; with the fighting frequently stopping for a close up of each character's face. Once again character animations were created used motion capture technology. Aoi's traditional Japanese dance animations were motion-captured from a traditional Japanese dance instructor. Aoi and Jeffry were the most difficult characters to depict, with Aoi's kimono proving a programming challenge and Jeffrey's muscle movement being controlled by "muscular control" software. The game was the last in the series until Virtua Fighter 5 R to include Taka Arashi. Hiroshi Kataoka, explained that the removal of Taka in subsequent installments was due to the technical implications of having a substantially larger character. Indeed, the character was nearly cut from Virtua Fighter 3 due to difficulties with his jumping moves. On July 26th 1996, a private showing of Virtua Fighter 3 was held in Kamata, Tokyo, Japan. Around July 1996, it underwent location testing at Tokyo Joypolis, before getting a wider release in Japan in September 1996. Reportedly the game was so popular during its initial location test that the average waiting time was eight hours, with people being forced to book slots ahead of time. The first cabinets in the United Kingdom appeared at SegaWorld London. Virtua Fighter 3 was followed by an update in Virtua Fighter 3tb, and a direct sequel in 2001's Virtua Fighter 4. Following its arcade debut, it was rumoured that Virtua Fighter 3 would be brought to the Sega Saturn. This was confirmed at E3 1996More... and then confirmed again the Sega Saturn Senryaku Happyoukai conference on the 8th November 1996 by Yu Suzuki However, given the complexities involved in converting Sega Model 2 games to the system, it was widely expected that converting a Model 3 game would bring significant challenges. During 1996 a promotional trailer for Saturn Virtua Fighter 3 was released in Japan, and subsequently passed across the world's press. The trailer comprised entirely of pre-rendered footage, with no gameplay shown and no references to dates or price. No in-game Saturn footage or screenshots were ever released to the public during the conversion's development. By mid-1997, all plans for an accelerator cartridge were scrapped, likely due to costs and the simultaneous development of a console successor to the Saturn. When the Sega Dreamcast began to make the news, it a port of Virtua Fighter 3 was once again expected, however significant delays meant that it was substituted for the improved Virtua Fighter 3tb. 3tb was a launch title for the console in all regions. Main article: Virtua Fighter 3/Magazine articles. In the Dreamcast port, the character model of Aoi Umenokoji consists of about 7500 polygons, with her head alone consisting of about 4300 polygons. In the water stage, the polygon count reaches up to 1.9 million polygons per second, about 32,000 polygons per scene at 60 FPS.